Have you ever aspired to become one of the richest men in the world? Although you might not be able to mimic the kind of ingenuity that led Elon Musk to mass-produce flamethrowers, you can still look like him. Two alleged Tesla and SpaceX employees have created free, life-sized printable masks in the likeness of their founder, just in case you require his facial features to join the fight against artificial intelligence. The other alternative would be cosmetic surgery, but that would probably require his budget. 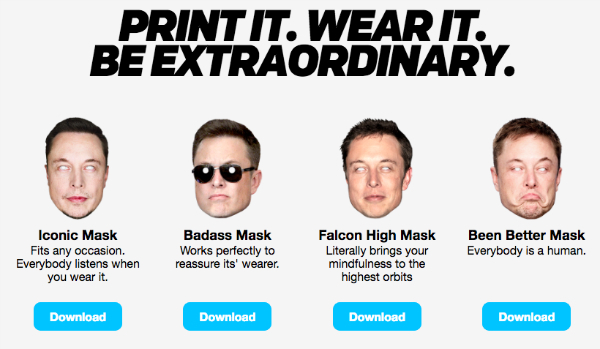 Hilariously and creepily named ‘Elon Masks’, the collection features four facial expressions ranging from ‘Iconic’ and ‘Badass’ to ‘Falcon High’ and ‘Been Better’. 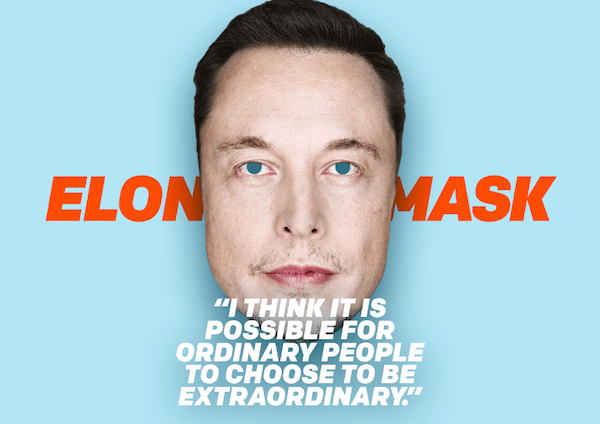 The creators assure this isn’t a belated April Fools’ Day prank—it’s here to stay, so print as many ‘Elon Masks’ as you’d like, whenever and wherever. View samples of the masks and get one for free here.